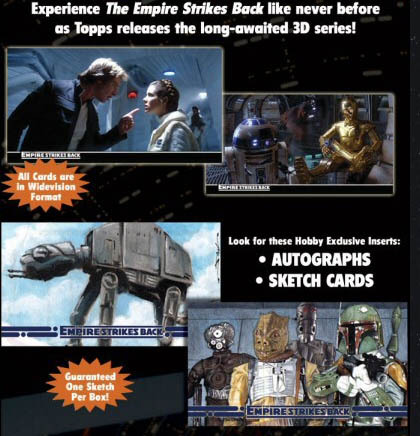 Celebrate the 30th-anniversary of The Empire Strikes Back with this all-new set of 3-D cards from Topps. The long-awaited follow-up to the highly-valued Star Wars 3-D set released in 1996, this set features 48 cards in breathtaking widevision that bring this fan-favorite film to life. Look for randomly inserted Sketch Cards!